Found in FNA Volume 24. Treatment on page 137. Plants tightly cespitose, not rhizomatous. Culms 14-50(80) cm tall, 0.4-0.9 mm thick, mostly glabrous, lower internodes often puberulent or pubescent, particularly below the nodes; nodes 2-3. Basal sheaths not becoming flat and ribbonlike with age, usually glabrous, throat sometimes with a few hairs, hairs about 0.2 mm; collars glabrous, including the sides; basal ligules 0.2-0.8 mm, truncate to rounded, membranous, glabrous; upper ligules to 2 mm, rounded; blades usually involute and 0.2-0.4 mm in diameter, 0.5-1 mm wide if flat, often arcuate distally, abaxial surfaces scabridulous, adaxial surfaces hairy, hairs about 0.1 mm. Panicles 4.5-20 cm long, 0.5-1 cm wide, contracted; branches appressed, lower branches 1-5 cm, with 2-7 spikelets. 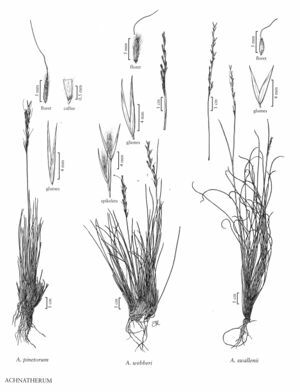 Glumes subequal, 7-11 mm long, 0.6-0.9 mm wide, lanceolate, not saccate; florets 3.5-5.5 mm long, 0.6-0.8 mm thick, fusiform, terete; calluses 0.4-0.6 mm, sharp; lemmas densely and evenly pilose, hairs at midlength 1.5-3.5 mm, apical hairs to 5 mm, apical lobes 0.3-2 mm, thin; awns 13-25 mm, persistent, twice-geniculate, first 2 segments scabrous; paleas 2.5-4 mm, from 2/3 as long as to equaling the lemmas, hairy; anthers 1.8-2.6 mm, dehiscent, not penicillate. Caryopses 2.5-4 mm, fusiform. 2n = 32. Colo., N.Mex., Utah, Calif., Oreg., Mont., Wyo., Ariz., Idaho, Nev.
Achnatherum pinetorum usually grows on rocky soil, in pinyon-juniper to subalpine associations, at 2100-3300 m. Its range extends from Oregon, Idaho, and Montana south to California, Nevada, and Colorado. It differs from A. webberi in its longer, persistent awns, and from A. lettermanii in its sharp calluses and longer lemma hairs.